Biokleen's Glass Cleaner Refill (available here in Large Sizes) is a highly concentrated version of their regular glass cleaner. Made with non-toxic, biodegradable ingredients, Glass Cleaner Refill can be used to clean glass windows, mirrors and other shiny surfaces, without harsh fumes, irritants, streaks or spots. It's even used for cleaning sealed hard wood floors and for high production work, such as that of cleaning services and in house maintenance crews. 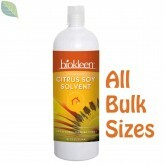 Biokleen's Glass Cleaner Refill is Non-toxic and safe to use around pets and plants. Use to refill the Ready to Use (RTU) version Spray Bottles. Use in two separate (RTU) Spray Bottles. One at regular concentration (1:64) and one at higher concentration (1:6) for stubborn spots. For Use with bucket/dip method, dilute at 1:64 or 1:28 depending on soil conditions. Water (filtered), Vinegar (Organic white distilled), Caprylyl/Capryl Glucoside (plant based surfactant), C10-16 Alkyl Glucoside, Sodium Methyl 2-Sulfolaurate (plant based surfactant), Laureth 7 (plant based surfactant), Glycerin (vegetable), Citrus Grandis (Grapefruit) Seed Extract, Citrus Aurantium Dulcis (Orange) Peel Extract, Citrus Aurantium Dulcis (Orange) Oil, Sodium Sulfate.